Is one of your goals to get more “Likes” on your Facebook Page? We’ll be the first ones to tell you that focusing on “Likes” to the exclusion of other efforts is a huge mistake. However, we also understand that most businesses run contests and promotions on their Facebook Page because one of their goals is to grow their Facebook presence. A few years ago, Facebook banned Pages from requiring fans to Like their Page before being able to enter a promotion or download a resource from that business. It was a move that motivated businesses to focus on the proper measurements, like engagement, interactions, shares and impact. It also resulted in a lot of businesses hosting their promotions outside of Facebook because they no longer were solely focusing on growing their Facebook Likes. It was also an opportunity for us to remind our users that using Action-Gating is a better option, one that can be used to collect useful contact information. All this aside, we continue to receive a lot of questions about how a business can use a contest or promotion to grow their Facebook Page and likes and the best answer is to encourage their fans to Like their Page somewhere on their contest. 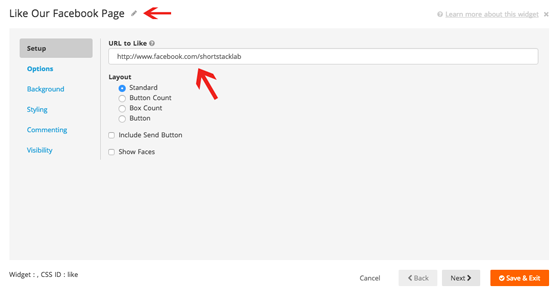 In today’s post, we’re going to show you how you can use ShortStack’s Like Button Widget to show a “Like My Page” Popup when a campaign loads. 1. 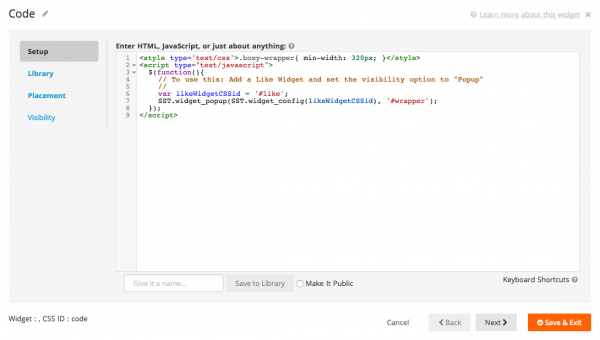 Add the “Code Widget” to your Campaign. 2. Copy and paste the code from the following link, into the code widget: Like Widget Popup Code for ShortStack. Click Save & Exit. 3. 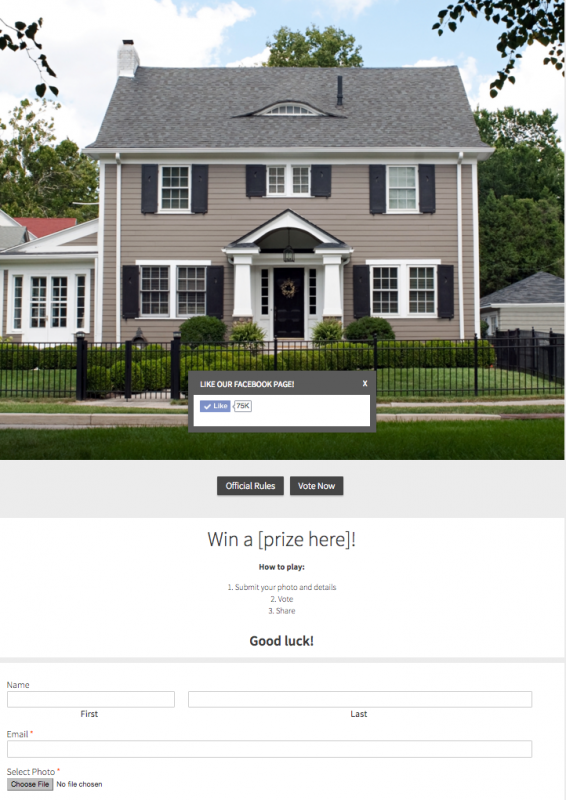 Add the “Like Button” Widget to your Campaign. 4. Change the title on the Like Button Widget to what you want your popup to say. Then add in the link to the Facebook Page you want your fans to Like under URL to Like. You can also choose between several different layouts for your popup. 5. 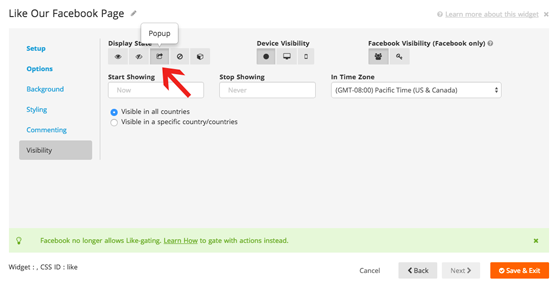 Click on Visibility on the left-hand side and set the Widget to display as a popup. Click Save & Exit. 6. Publish your Campaign, making sure it is published to Facebook. You can adjust the dimensions and look of your popup in the Code Widget.